MARCH 2018: We are adding new Auxilliary ("Aux") boards to simplify the Sustainiac installation process. Over the years we spend much time and communicating by telephone and email when customers complain that their sustainer "squeals" (uncontrolled oscillation) or doesn't work at all. The problems are nearly always due to wiring mistakes. The wiring is too complicated for many people, even many professional luthiers. See the "BEFORE-AFTER" photos near the top of our INSTALLATION PAGE for an example of a guitar that was sent to us because the Sustainiac "squealed". The problem was signal crosstalk due to improper wiring. The Aux boards won't fit into smallish cavities. But for many guitar models this will produce a superior Sustainiac installation and save hours of labor. Aux-TT board in a Jackson DK-2 Semi-Installation. Note most wiring done by Sustainiac connectors. are equipped with the Sustainiac Stealth PRO. 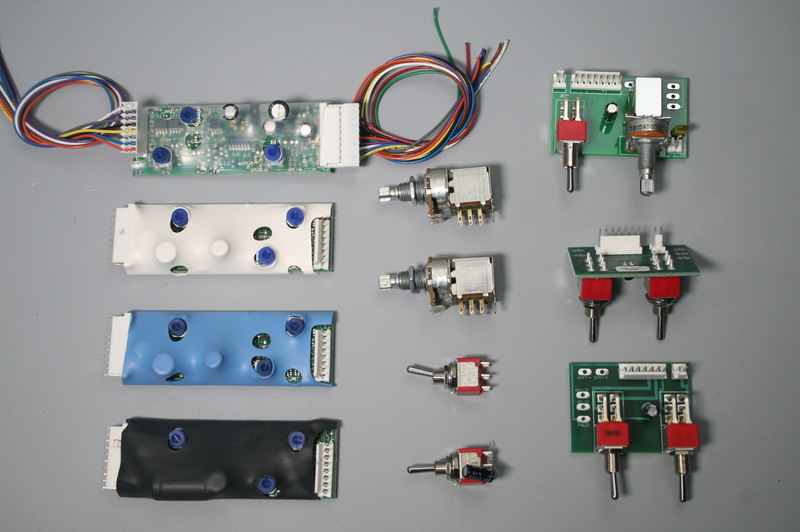 Go to our new AUX-BOARD PAGE for examples of simplified installations using these new boards. They add $10 to the Sustainiac kit cost. But the labor-saving and simplicity make it worth while. You can either scroll down the page, or use the topic headings below to jump down to the various topics. Then, use your browser "BACK" button to return to the TABLE OF CONTENTS. NEW EXPANDED SEMI-INSTALL OPTION : We do 90% of the work on most guitar models, not just Strats. Link to STEALTH PRO INSTALLATION PAGE This major link is repeated several times on this page, and also at the bottom SITE MAP. COMPATIBILITY WITH ACTIVE PICKUPS, such as EMG â etc. A complete list of DETAILED TOPIC LINKS is contained near the bottom of this page. This contains all the links posted throughout the STEALTH PRO page. OTHER SUSTAINIAC WEBSITE PAGE LINKS: The overall site map is at the very bottom of each page, including our email address, phone number, shipping address etc. The Sustainiac Stealth PRO kit price is $229.00 plus shipping for the 6-string version, or $249.00 for the new 7-string version. This includes all parts, controls, driver, and circuit board. Options are available. You can order directly from us from anywhere in the world, using the link to the ORDER FORM at the bottom of this page. We take Paypal, Visa, Mastercard, money order, USA checks. The Stealth PRO must be installed into your guitar. Installation requires considerable electronics skill, and can take from 3 to 12 hours or even more for very difficult guitar models. Options and more detailed prices are shown on the ORGANIZE YOUR ORDER page, or the EMAIL ORDER FORM Copy and paste this page into an email addressed to us. Also see link at the bottom of this page. The Sustainiac Stealth PRO is designed and manufactured by Maniac Music Inc., Indianapolis, Indiana, USA. You can get screaming feedback sustain at any volume at home, in the studio, or on stage. You can "morph" the sustained string vibration into cool-sounding harmonics during a solo, by using the Harmonic Mode control. This allows you to give your solos character and originality in a way that was previously only possible by getting feedback from your amp at dangerously loud levels. It is similar to amp feedback, except that the feedback sustain is more predictable and much easier to achieve. 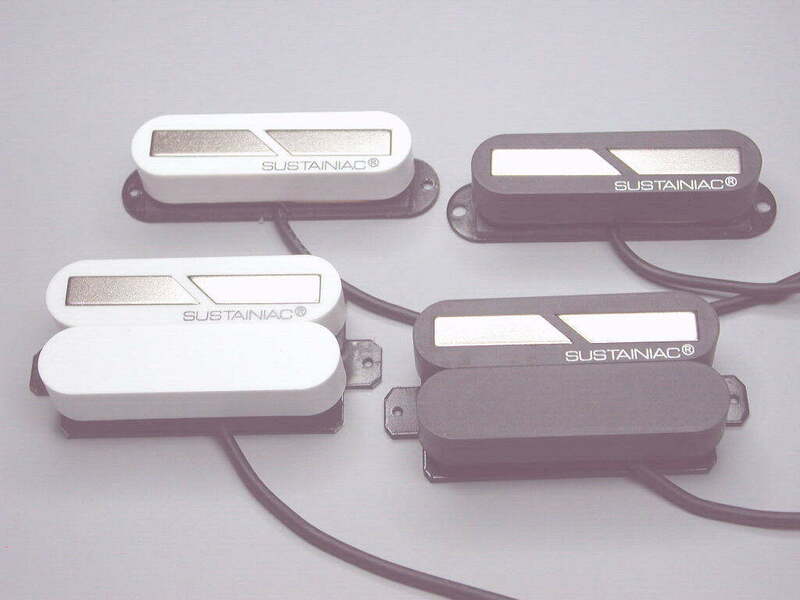 The Sustainiac Stealth PRO sustain system drives the strings of an electric guitar into infinite feedback sustain of string vibrations by electromagnetic feedback. You control the feedback sustain by simple hand muting. Also, you don't have to blast your ears with dangerous sound levels of a large amp. It doesn't change the tone of your guitar pickups or output signal, because it operates directly on the instrument strings. Hear examples on the SOUND PAGE. Go to the PERFORMANCE SECTION for more info on using the Sustainiac Stealth PRO sustainer in performance. Many people mistakenly refer to our "Sustainiac pickup", because all they see from the front of the instrument is the magnetic string driver. This driver does resemble a pickup in appearance. But the Sustainiac Stealth PRO sustainer is much more than this. It is actually an electromagnetic sustain system that contains three main parts. SUSTAINIAC DRIVER: The Sustainiac driver replaces your neck pickup. Choose single-coil size driver, or humbucker size. Choose black or white driver (black only for new 7-string driver). The Sustainiac has an ON/OFF control and also a HARMONIC MODE control. Dimensions etc. are shown in the next section below. 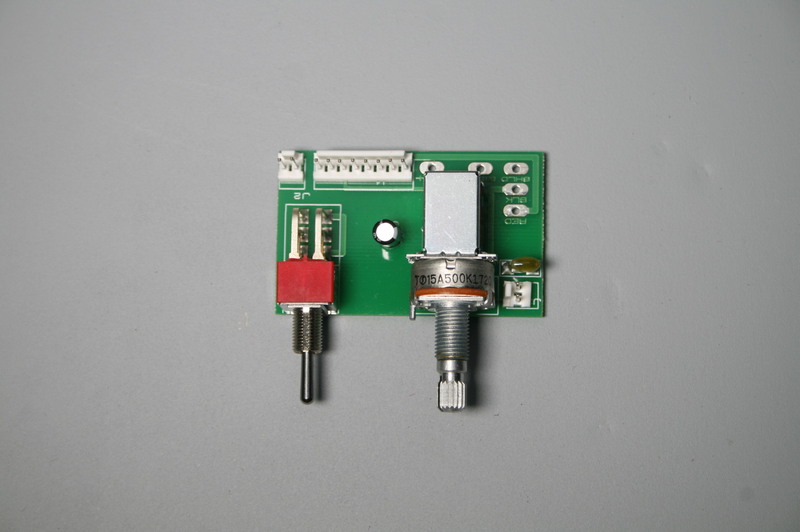 SUSTAINIAC CIRCUIT BOARD: The Sustainiac circuit board can be installed into most electric guitar electronics cavities with little or no routing. It will take 3-12 hours to install, depending on your skill as an electronics technician. The installation is quite involved, and the instructions must be followed very carefully. We offer different installation services, described midway down this page. SUSTAINIAC CONTROLS: Each kit comes with an ON/OFF control and also a HARMONIC MODE control. Choose between toggle switches or push-pull switches (or some other options). More about these below. We added a new sustainer DRIVE CONTROL OPTION for customers who use a TOGGLE SWITCH for Harmonic Mode control. You can use this option or not. Your choice. For push-pull Harmonic Mode control, you already have a built-in Drive control. NECK PICKUP SOUND OPTION: We added a couple of wires that can be grounded by a simple DPDT switch to turn the neck pickup single-coil sound to a darker, louder (6dB) humbucker sound. Now, you can get more flexibility from the active neck pickup function of the Stealth Pro. A list of DETAILED TOPIC LINKS is contained at the bottom of this page. These are links to various pages that go into detail about certain aspects of installing and using the Stealth PRO. An INSTALLATION PAGE contains installation explanations and diagrams for specific guitar types and models. This page is linked frequently in the website, because it is so important. It also tells you about things that might make a guitar unsuitable for an electromagnetic sustainer. When you think you might be about ready to order, there is a page for Organizing your order. This organization outline should help to eliminate the confusion that often arises over the many available options. The Sustainiac Stealth PRO has evolved from our earlier electromagnetic sustainers GA-1, GA-2 (late 1980's, installed into thousands of Hamer, GTX (Kaman), and Fernandes guitars, Sustainiac Stealth model (1999), and Stealth PLUS model (2001). Starting with the Stealth kit in 1999, we began making our kits "stealthy", with the controls separate from a small microelectronics circuit board. This allows you to install the unit into most electric guitar models without having to do any routing. So, you can restore the guitar to its original condition if you want. Our sustainers are the only commercially available sustainers with this capability. 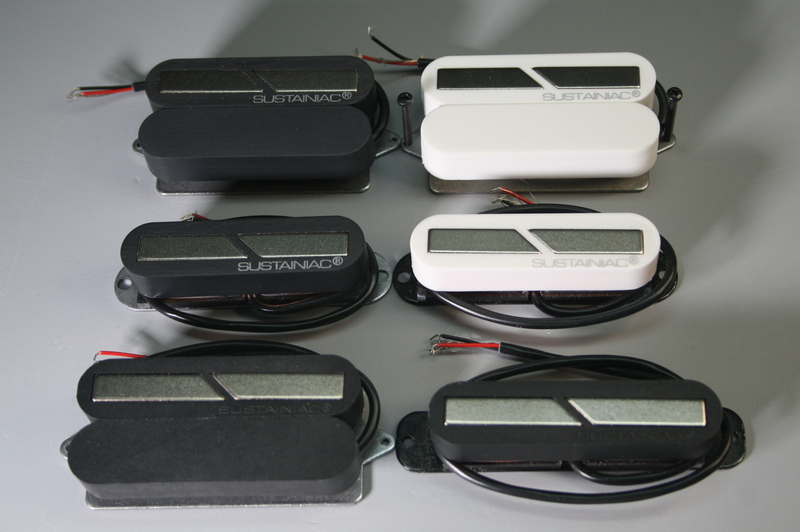 We set out to design the Sustainiac Stealth series of sustainers to solve the main problems of all previous sustainers. This included both problems of sustainer performance, and also practical problems with doing the installation into existing guitars. The new Stealth PRO can be installed into most popular electric guitars with NO ROUTING in most cases, or minimal routing. We have revolutionized magnetic sustainers with the Stealth PRO sustainer and its predecessors. ELECTROMAGNETIC STRING DRIVER TRANSDUCER: Click here for driver options picture: SIX DRIVER OPTIONS; The two drivers at the bottom of the photo are for 7-string guitars (and 5-string basses). The driver usually replaces your neck pickup. (In some applications, it can replace the bridge pickup. For instance, a lot of Strat players depend mostly on their neck pickup. In this case, you must mount the bridge-position driver so that it no longer is slanted.) It can not replace a middle pickup in a 3-pickup guitar, however. It will be too close to the other pickups, and the sustainer performance will be severely affected. We need 3 inches MINIMUM spacing between bridge pickup and Sustainiac driver (measured center-to-center). 3.5 inches is even better. The driver emits electromagnetic pulsations in response to the instrument string vibrations. These electromagnetic pulses cause the string vibrations to sustain by magnetic force. When the sustainer is OFF, the driver functions as an active neck pickup. One of the two "trimpot"controls on the circuit board allows you to set the neck pickup volume to match most any bridge pickup on the market. One new feature of the Stealth PRO is that the active pickup sound can be set for a bright, single-coil like sound (although it is hum-canceling), or a darker humbucker sound by connecting a wire to ground. You can also boost the output level by 3dB by connecting another wire to ground. Or, a switch (toggle or push-pull) can be installed so that you can switch back and forth between these sounds. Drivers are available in single-coil (SC) size or humbucker (HB) size. Color choices are black or white. (Black only for 7-string driver) You choose the size and color when you order. The HB-size driver is identical to the SC-size driver, except for the size of the baseplate that it is mounted on. Also, we stick a plastic "dummy" cover onto the HB driver cover to make it look more like a regular humbucker pickup. Both the HB and the SC driver have identical sound as a pickup, because this is determined on the circuit board. They also both perform identically as a driver. SIX-STRING DRIVER: Also fits 4-string basses. Available in white or black. The driver height is 0.85 inches (21.6mm) for both HB and SC. HB baseplate width is 1.375 in. (35mm), SC width is 0.7 in. (17.8mm). Length of HB is 3.325 in. (84mm), SC is 3.23 in. (82mm). See PDF file for 6-STRING DRIVER DIMENSIONS. SEVEN-STRING DRIVER: Also for 5-string bases. Available in black only. The driver height is 0.85 inches (21.6mm) for both HB and SC. HB baseplate width is 1.375 in. (35mm), SC width is 0.7 in. (17.8mm). Length of HB is 3.73 in. (94.7mm), SC is 3.75 in. (95.3mm). See PDF file for 7-STRING DRIVER DIMENSIONS. SINGLE COIL SOUND: The sound is very similar to a Strat neck pickup, but with virtually no hum. The blend of the neck pickup with a typical single-coil middle pickup does not give as good a "quack" sound as a real single-coil combination, but the main "quack" sound is the bridge/middle combination anyway. Blues players tend to love the neck pickup sound. HUMBUCKER SOUND: The humbucker sound is very fat, similar to a stock "59" sound, but can have much higher output if you turn the trimpot control up high. Also, it has noticeably less hum than a typical passive humbucker. You can make it darker by adding a resistor or pot between one of the circuit board wires and ground (see Installation page for specific info on this). The driver design of the Sustainiac Stealth PRO is unique. Its patented bilateral design makes magnetic field cancellation from the driver nearly perfect. This means we can set the sustainer gain higher than with other sustainers in the marketplace before the closed feedback loop oscillates (squeals). This is the main thing that sets the Sustainiac sustainers apart from all of our competition, achieving strong, consistent sustained string vibration with most all guitar types. Read the many unsolicited user reviews on HarmonyCentral.com and various chat-groups. CIRCUIT BOARD: The Stealth PRO circuit board measures 3.75in. x 1.1in. x 0.5in. thick (95mm x 28mm x 12.5mm). See this PDF drawing: Stealth PRO circuit board dimensions It runs on a single 9-volt battery. 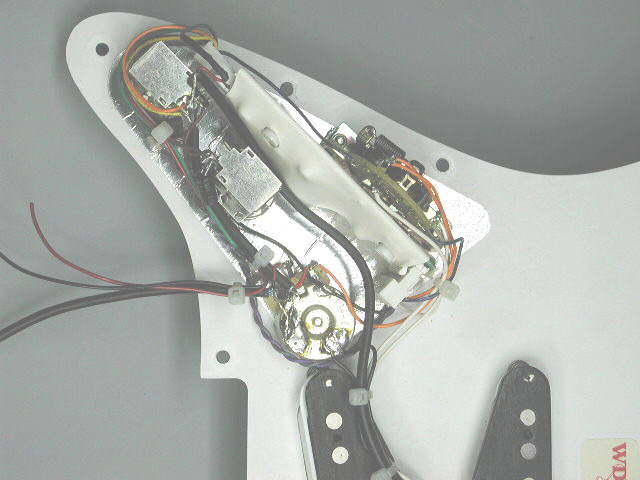 You install the board inside the electronics cavity of your electric guitar. It must be electrically connected to your pickup selector and sustainer controls. Complete installation instructions and diagrams come with each kit. The circuit high impedance input is connected to your bridge pickup. It amplifies the bridge pickup signal, and does other electronic processing to it. It then applies this amplified, processed bridge pickup signal to the electromagnetic driver. Your raw bridge pickup signal goes on to your other guitar effects, amp, etc. with no processing or change in its original sound. When the sustainer is OFF, an amplifier circuit on the board amplifies the driver signal, enabling it to be used as an active neck pickup. Click here for a WIRE FUNCTION DIAGRAM, showing the function of each color-coded wire. When the Sustainiac is OFF, the Sustainiac driver is used as an active pickup. The sustainer circuit now amplifies the tiny driver pickup signal to a useable level. Pickup equalization is done on the circuit board. Two wires are provided to allow switching between single-coil (SC) and humbucker (HB) sound. These are the white/violet wires on the 10-pin connector. If you connect the white wire to ground, it boosts the gain by about 4 dB. Connecting the violet wire to ground rolls off the highs. If neither wire is connected to ground, then the default sound is SC. If you want to use this function to switch between SC and HB, simply connect both wires to ground with a toggle or push-pull switch. The Stealth PRO uses a unique, patented "class D" amplifier to drive the strings into intense sustained vibration, while using only a small amount of power from the 9-volt battery. It is the combination of this circuitry along with the patented bilateral driver that sets the Sustainiac Stealth PRO apart from our competition. You get stronger, more consistent sustain from instrument to instrument. You have the option of choosing either push-pull pot/switch controls, or toggle switch controls for these. Or, you can choose one of each. You get all 3 HARMONIC MODES with either toggle or push-pull controls. 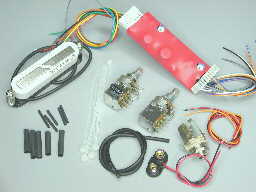 Other "esoteric" control options (such as using a Superswitch as the single control for the Sustainiac) are described on the CONTROLS PAGE. This combination of separate controls and small circuit board (with no routing required in most installations) further sets us apart from the competition. It makes for a stealthy installation. If you want to restore the guitar to its original form and function in the future, you can do so. When the sustainer is turned ON, the bridge pickup is automatically selected, regardless of the position of the pickup selector switch. It HAS to be this way, because the driver must be physically distant from the pickup that provides the input signal to the sustainer. Otherwise, uncontrolled oscillation (squealing) occurs. (Similar to having a microphone too close to the speakers in a PA system.) When you turn it OFF, the pickup selector goes back to normal function. The Sustainiac ON/OFF push-pull control uses only the switch portion of the control. Therefore, its pot portion functions as the original guitar control that it replaced. The HARMONIC MODE control uses both the pot and the switch portion of the control, so the control that it replaces goes away. For a 2-pot guitar, you will lose either the volume or the tone control, unless you are willing to drill a new hole. If you choose toggle controls, you will likely need to drill new holes in the front of the instrument. Sustained string vibration can be "morphed" into different cool-sounding harmonic modes. This enhances your solos in ways that were not previously possible. You get all 3 modes (see below) whether you choose the standard push-pull control, or the 3-position toggle control. The push-pull control option allows the same control to serve as a sustain intensity control, and also produce all 3 harmonic modes. With the 3-position toggle option, you can add an optional sustain intensity control pot (new feature with the Stealth PRO). Normal Mode: Sustained string vibrations occur in the "normal" way that you get when you pluck a note. The technical term for this is the fundamental vibration mode, or 1st harmonic. For the PUSH-PULL control, it is pushed in, and rotated full clockwise. As you rotate the control away from full clockwise toward the center, the sustainer gain/drive decreases. At mid-rotation, the drive is ZERO. Harmonic mode: All sustained notes morph into a high harmonic vibration mode. It will usually be a 5th or 7th harmonic, but can be other harmonics depending on the string length. For the PUSH-PULL control, it is pushed in, and rotated full counter-clockwise. Mix mode: This is actually a second harmonic mode, with a different set of harmonics. We call it MIX mode because some frets yield fundamentals, while others yield harmonics. Notes below the 12th fret will mostly morph into 2nd or 3rd harmonics. Above the 12th fret on the little e or B strings, most notes will stay as fundamentals in Mix mode. For the PUSH-PULL control, it is pulled out, and rotated full clockwise. Which type is best, push-pull or toggle? Each type has its own advantages. For most professional musicians, toggle controls are generally best. They are faster to access during a solo. But, you usually have to drill new holes in the guitar body to mount toggle controls. If you choose push-pull controls, you can restore the guitar to its original condition if you decide to sell it. One thing to consider: It is most important to have fast access to the ON/OFF switch during a solo. Toggle is best for this. But once you have a note sustaining, you have some "leisure time" to change the harmonic mode of the note, because at this point you are just holding a long note. So, the push-pull can be good here, especially since it has a built-in sustainer drive control. Go to the CONTROLS PAGE for more info on the different options for Sustainiac Stealth PRO sustainer controls. You will get about 15-40 hours on an alkaline battery, depending on how much you actually use the sustainer. Don't use the cheaper "dry-cell" or "long-life" (actually just a dry cell). These are a little less expensive than alkaline, but the shelf life is only about one year, and they lose capacity much faster than alkaline. You pay less for total "sustain time" using alkaline. A 9-volt alkaline battery has about 500-600 milliampere hours of energy. When the sustainer is sustaining a note, battery current drain is about 50 milliamperes (ma). So, you should be able to hold a long note for about 10-12 hours. Call Guiness BWR first! When hand muting with the sustainer ON, current drain is about 10ma. When the sustainer is turned off, current drain for the active neck pickup is about 2ma. You can get a good estimate from this info. No battery current is consumed until you plug a mono guitar cord into the guitar output jack. DO NOT PUT TWO BATTERIES IN SERIES TO MAKE 18 VOLTS. Certain components on the Sustainiac circuit board might fail. Also, the neck pickup only functions between 7 and 10 volts. DEAD BATTERY INDICATION: When the battery voltage decays to about 7 volts, the neck pickup will stop functioning. At this time, the battery is almost "dead". The sustain function will continue down to about 5 volts, and will get weaker and weaker as the voltage continues to decay. Strange pulsations are also likely to occur at this low voltage. If you take the battery out (or it dies), the bridge pickup will continue to function. The bridge pickup is direct wired to the pickup selector. So, you never lose its function and become "stranded" at a gig. In our opinion, this is the best portable option. But, it does require that you route a cavity into the back of the guitar body. We sell the single battery case for $16. The dual case is $25. If Maniac Music does your installation, we charge $25 to route this cavity. Click here Gotoh battery case dimensions for a PDF drawing showing the battery case dimensions, and routing mechanical info. 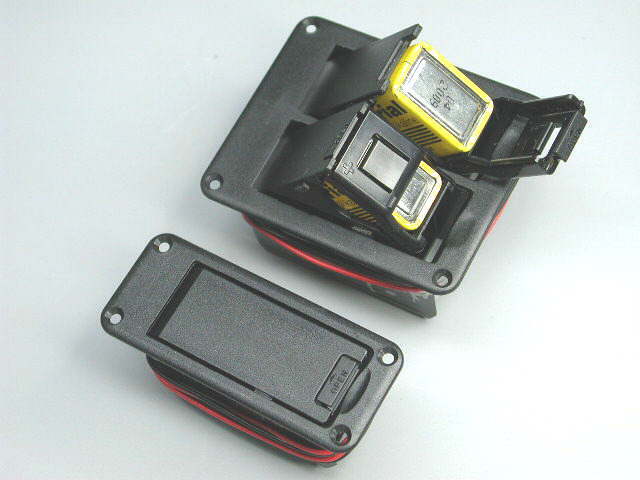 PARALLEL BATTERY CONNECTION: Some people inquire about putting 2 9-volt batteries in parallel to extend battery life. They order our dual battery case for this. This will work if both batteries are NEW AND IDENTICAL (same brand). But we don't recommend it. If you leave your guitar on a stand with the cord plugged in, and don't play for a few days, BOTH batteries will die. If you worry about having the battery die while playing a gig, here is a better idea: Get the dual case but leave one side disconnected. Just use it as a spare battery holder. OTHER POWER OPTIONS: Link to the POWER SECTION for more details on this subject. RECHARGEABLE BATTERIES: Most NICAD "9-volt" batteries are actually only 7.2 volts. These are unacceptable. Some newer NiMH (nickel-metal-hydride) batteries are 8.4 volts or 9.6 volts. The 9.6 volt is better than 8.4 volt. They don't hold charge as long as a 9-volt alkaline, but you get the advantage of recharging. There are starting to be newer technologies on the market, such as Lithium-ion. These should be OK, as long as they are a true 9 volts. USING WALL SUPPLIES ("WALL-WARTS"): You must use a REGULATED supply of 9.0 volts. Most "wall-wart" supplies are UN-REGULATED. This means that they put out 9 volts AT RATED CURRENT. At less current, their voltage goes up to as much as 12 to 14 volts. DON'T USE AN UN-REGULATED SUPPLY. We sell a regulated 9 volt supply for $25. You will have to install a connector on your guitar to accept the supply. Installation is not a trivial task. It requires experience with electronics, soldering, following wiring diagrams etc. It will usually take between 3 and 12 hours, depending on the guitar type and the skill/experience of the installer. If you are not experienced, we recommend that you have an experienced ELECTRONICS TECHNICIAN do the work. We offer an installation service on most guitar types. See below for more information on this. We have found that many experienced luthiers are not experienced with technically challenging electrical installations. Question your installer before allowing him/her to proceed. Alternatively, we offer a Semi-Install option , where we do 90% of the work. This is described further down the page. Refer to our INSTALLATION PAGE for more details on specific guitar models. Lots of ideas are presented, and also hookup diagrams for most common guitar types. A detailed, illustrated installation manual is included with each Sustainiac Stealth PRO sustainer kit. Click here for a PDF file of our 8-page installation book that we include with each kit. As an option, Maniac Music will totally install the system into your guitar for approximately $125- $175, depending on the guitar type. We charge extra for routing. For instance, if you want us to install the optional battery case ($16.00), we charge $25 to route the cavity. The Parker Fly (original version with large Fishman board and "octopus" ribbon cables) is $175. The new point-to-point version is a little easier, $150. More details are given on the INSTALLATION page. Shipping your guitar to Maniac Music: Click here for PDF instructions Shipping guitars. Seymour Duncan "Blackout" active pickups" THESE WORK OK, but you can't run the Sustainiac driver wire near the bridge pickup. The Sustainiac driver wire is shielded for electrostatic radiation. Since it carries quite a bit of ac current, it radiates a small, pulsating magnetic field. When the driver wire runs near a Blackout pickup, the magnetic sensitivity of these pickups is so great that it responds to the Sustainiac driver current. The solution is to route the driver wire so that it is an inch or m ore from the Blackout pickup. Fishman "Fluence". NOT ANYMORE. We had trouble getting this to work, but have solved the problem. IT WORKS GREAT NOW! Pickguards with aluminum or copper "mirror" effects, or some metallic finishes on the guitar body: Remove the foil from around the pickup area on pickguards. The magnetic pulsations from the driver induce pulsating "eddy" currents into the conductive aluminum or copper. These in turn radiate their own magnetic pulsations. The bridge pickup responds to these magnetic pulsations. The end result is that the desired magnetic balance between driver and bridge pickup is compromised. We remove the shielding foil that comes on Jems and also US-made Strats from around the pickups. You can keep the foil over the electronics cavity. If we do your installation into a Strat, Jem, etc., then we include this service. ON THE OTHER HAND: We put a Sustainiac into one of Steve Vai's all-mirror guitar and it worked great. Presumably because there was SO MUCH aluminum that the circulating electrical currents were ALL DISSIPATED before they reached the bridge pickup. Metal pickup trim rings: Mostly, these are OK. But sometimes it produces the same problem as #7. If you experience distortion or uncontrolled oscillation, try switching to a plastic trim ring. If the problem goes away, that was the reason. Concealing the driver: If you cover up the driver (to fool people into thinking you are Superman), you move the driver farther away from the strings by the thickness of the cover. This reduces the sustainer performance. Paint should work OK, or very thin plastic etc. Using a metal cover upsets the magnetic balance of the driver. ABOUT COIL-TAPPING: Humbuckers have two coils that are arranged in series in a way that each coil produces an equal-but-opposite response to external magnetic "hum" fields (they "cancel"), and equal but same response to string vibrations. It is what makes them have "hum-cancelling" properties. It also makes them have a sound that is less bright than a single-coil pickup. 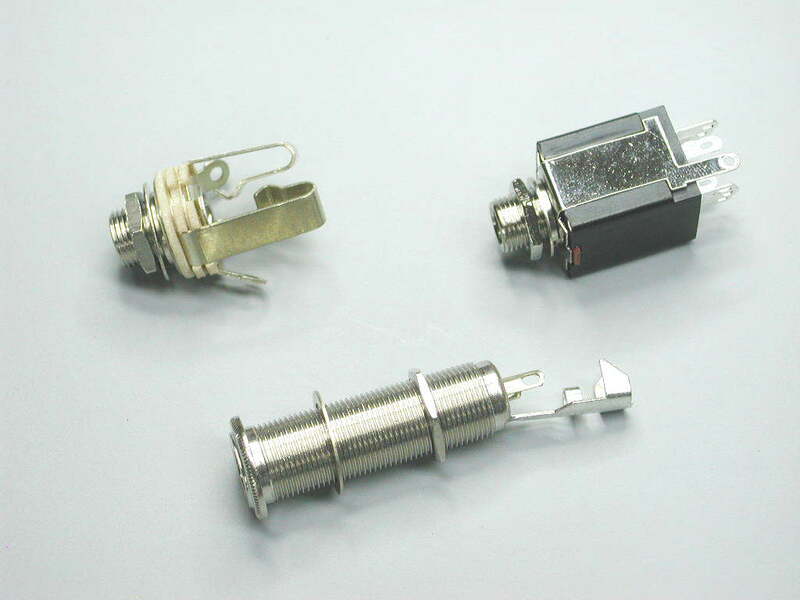 Many people like to disable one of these two coils by using a switch to short to ground at the point where they are connected together. This gives a pickup that is no longer a humbucker, but a single-coil pickup. The Sustainiac will function with a bridge humbucker having a coil-tap switch. BUT REMEMBER: When we ship a circuit board, we ask the customer to specify whether the guitar has a humbucker or a single-coil pickup. 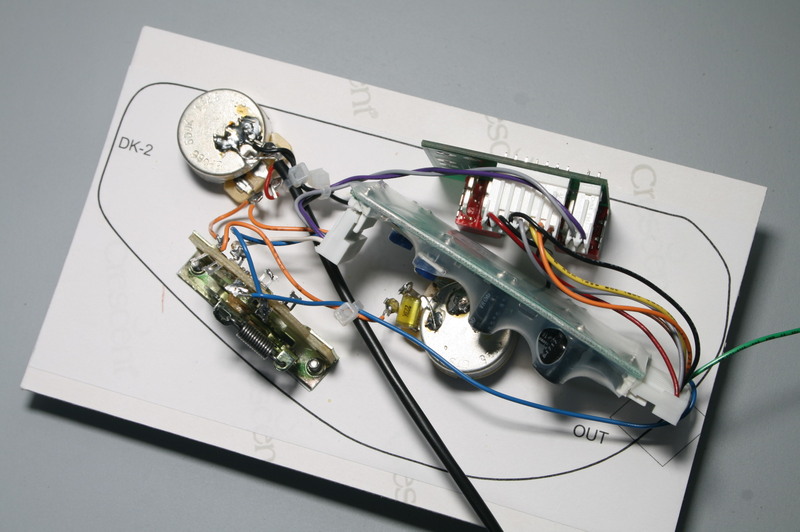 We make circuit boards with two different internal equalizations, depending on which pickup type the guitar has. A guitar with a bridge HB, if used with a Stealth PRO having SC equalization, will have a hot NORMAL mode, but a weak HARMONIC mode. If you have a guitar with SC bridge pickup but a Stealth PRO with HB equalization, you will have a weak NORMAL mode, and a HARMONIC mode that will likely squeal (oscillate) because it has too much gain for the SC bridge pickup. Granted, there is now a separate trimpot for HARMONIC mode on all the Rev. 5.4 and above boards, which will partially compensate. But if you use a COIL-TAP SWITCH, one of the pickup positions will be compromised. This usually doesn't cause any big problem, but we like for people to know what to expect. DRY-RUN INSTALLATION You can do a "quickie" installation on any questionable guitar to determine its suitability. Click here for a PDF file of the whole procedure:"DRY RUN" TEMPORARY INSTALLATION Click here for a PDF diagram: "DRY RUN" DRAWING It takes about 15-20 minutes. Install the driver, and hook up the bridge pickup to the sustainer input, connect a battery and a few other wires to ground. Connect a guitar amp. This will instantly tell you if this guitar will be suitable. We do this on many guitars to save headache/heartbreak. This is only practical for guitars with open-back electronics cavities. Not practical for most pickguard guitars. Many more details are given on the INSTALLATION PAGE, along with hookup drawings of the most popular guitar types. COMPATIBILITY WITH ACTIVE PICKUPS, such as EMG etc. The Stealth PRO kit is compatible with active pickups such as the EMG. etc. The EMG supplies a perfectly good input signal to the Sustainiac. (But its polarity is reversed from most other pickups, so to compensate for this you have to remember to reverse the red/black Sustainiac driver wires.) Be sure to specify on the SUSTAINIAC ORDER FORM that you are running EMG's etc. by clicking on the appropriate button. This is because the output impedance of the pickup amplifier is a little different than for normal magnetic pickups because many people use 25K ohm volume and tone controls with EMG's. If you elect to use push-pull controls, we can supply the ON/OFF control with 25K ohms if you wish. You don't HAVE to use 25K controls as many people think. The advantage of using 25K ohm controls is that they allow you to use a longer output wire before high frequency rolloff occurs. If this is important to you, then 25K is good. NOTE ABOUT USING ACTIVE PICKUPS: Active pickups hook up just like other pickups except for the battery connection. They have a shield wire that connects to ground (usually a pot body), and an output or "hot" wire. The battery (-) wire must be disconnected from ground when you are "unplugged", or the battery will continue to run all the time. Furthermore, you must use two separate 9-volt batteries, one for the active PU, the other for the Sustainiac. Otherwise, oscillation can result. Since sustainers use up batteries much faster than preamps, when the sustainer battery dies everything will stop working. You might be able to finish a gig with no sustainer, but you will need your pickups! When you have two batteries, you must replace your output jack with a special 9-pin TRS jack.. Click on the PDF file which shows how the jack is used, and why, and how it is hooked up. This 9-pin jack has built-in switches that disconnect both batteries independently when you remove your guitar plug. Be sure to check this on your order form if you use active pickups. COMPATIBILITY WITH PIEZO-ELECTRIC PICKUPS You can operate the Sustainiac if you select your piezo as the guitar output. Piezo pickups, on the other hand, don't provide a good input signal for the sustainer. Piezos and digital modelled pickups, etc. 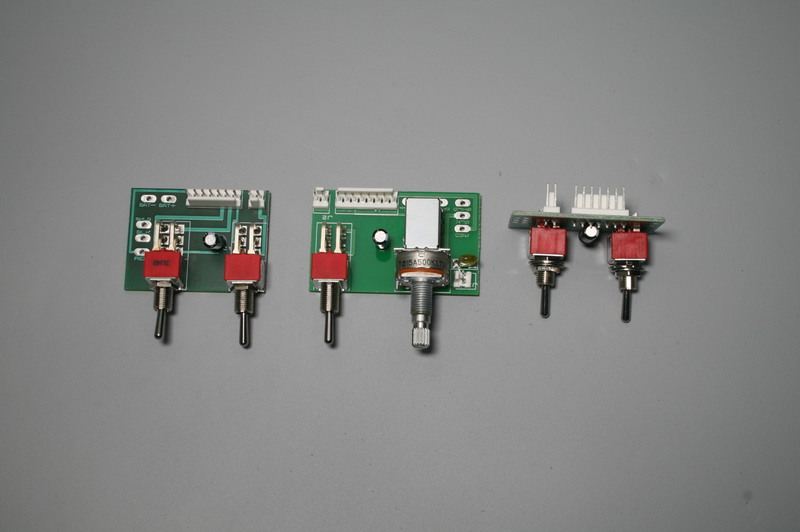 produce phase shift in the signal which alters the performance of electromagnetic sustainers. So, you must add a conventional MAGNETIC PICKUP INPUT as a bridge pickup for the guitar, to provide a suitable input signal for the sustainer. But, you can use piezos while the Sustainiac is on, and they don't interfere with each other. Same thing for guitars having hexaphonic pickups such as the Roland GK-2a for synths etc. See the next topic for details on this. COMPATIBILITY WITH GK-2, GK-3 and other SYNTH PICKUPS So, you must add a conventional MAGNETIC PICKUP INPUT as a bridge pickup for the guitar, to provide a suitable input signal for the sustainer. Then it will work OK. Guitars having these special, hexaphonic magnetic pickups located next to the bridge provide a specialized low-output signal for driving hexaphonic synth systems and also the Roland "VG" systems. The outputs of the synth/VG systems generally do not have a suitable phase response for electromagnetic type sustainers such as the Stealth PRO. Stealth PRO for bass guitar: We have a special version of the Stealth PRO circuit board that allows strong sustain down to the very lowest notes. No extra charge. Just specify on the Order Form that you want it for bass guitar. Bass guitar recommendations:The main thing is for the bridge pickup to be a "non-offset" type. Typical Jazz bass "J-type" pickups are straight, and work fine. The "P-type" has two coils that are offset. This design upsets the magnetic balance between driver and bridge pickup, which is necessary for proper sustainer operation. Therefore, the P-type pickup is not recommended. HEXAPHONIC MODEL We do not currently make a hexaphonic sustainer. These have six (or 7 etc.) independent sustainers. They allow complete sustain of chords. There are no immediate plans to make one. Occasionally, we get such a request but not very often. The size and complexity of such a sustainer would make the "STEALTHY" concept obsolete. Retrofit of such a sustainer would be a major project. The expense would be quite high. Furthermore, for most soloing, there would not be a great advantage. We may eventually do this, but not in the near future unless the request rate increases. ORGANIZE YOUR ORDER When you get ready to order, go here to see a list of all options and their prices. All information is presented in an outline/checklist manner. Use this to organize your thoughts about your installation plans. 8-PAGE INSTALLATION MANUAL This is the manual that comes with the Stealth PRO kit. GUITAR CONTROLS Detailed, useful info about standard guitar controls (volume, tone, pickup selectors) for those who want to know more. Also helpful for troubleshooting. Output jack choices, low resolution (10KB); Output jack choices, high resolution (70KB).